On Thursday September 26th, the conclusion of the Youth Bloggers Interactive Workshop, taught by Pedro Miguel Arce, columnist for the Mexican daily newspaper La Jornada was held from Monday the 23rd at the headquarters of the Information Center for the Press in Havana under the auspices of the José Martí International Institute of Journalism. A video-conference was held so that fleeting shooting star and, at the time, renowned Wikileaks founder Julian Assange, could have an interchange with students, journalists and Cuban bloggers, that is, nothing more nor less than with the representatives of the official press. On Thursday September 26th, the conclusion of the Youth Bloggers Interactive Workshop, taught by Pedro Miguel Arce, columnist for the Mexican daily newspaper La Jornada was held from Monday 23th at the headquarters of Information Center for the Press in Havana under the auspices of the International Institute of Journalism José Martí. A video-conference was held so that fleeting shooting star and, at the time, renowned Wikileaks founder Julian Assange, could have an interchange with students, journalists and Cuban bloggers, that is, no less than with the representatives of the official press. Of course, we must not forget that Julian Assange seems to be quite candid, and, not by choice two evil women — whom now Mr. Columnist for La Jornada, an expert in communication, defines as “two dubitable Swedes” — tried to involve him in a lawsuit under “false accusations,” who knows with what intentions. By the way, I don’t quite understand the use of the adjective “dubitable” in this context, but it really doesn’t sound very kind. At first I would have wished that some of the students and young Cuban bloggers gathered there had pointed out to the editorialist that that’s not how revolutionaries refer to women, but then reconsidered when I recalled the revolutionary methods used in Cuba to treat females: the Ladies in White and other women embarrassing to the regime are living testimony of this. In comparison, it could almost be said that Mr. Arce is the perfect gentleman. In any event, Assange contributed little to the journalists’ meeting. In addition, the invitation to the Australian was made quite late, the Assange case is already more than cold, so the issue does not qualify for marketing. 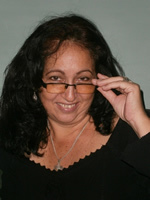 As for his solidarity and sympathy with the four spies for the Cuban dictatorship, it went from being a pretty gray parley for someone who once shone in the minds of Internet freedom, but at the end is an inconsequential personal position that could be dispensed with, yellow ribbon and all. Once there were independent Cubans who were attracted by the somewhat romantic idea of standing up to the monopolies of information and, in fact, there were those who openly declared their admiration and sympathy for Assange. Not me. Personally, experience has taught me to distrust all messiahs of any color, especially those that offer the status quo as an offset to total anarchy. We know by now that under the skin of this smiling little blond, who strives to come across as sympathetic, are hidden twisting paths, very different from the transparency he claims in his preachings. However, this star in its twilight fell sharply into the temptation to take sides when he accepted an interchange — not with an audience representing the full spectrum of Cuban digital journalism with multiplicity of voices, proposals and thoughts which could be a real show of freedom — but with a select group of individuals who had to go through the most rigorous screenings to be elected as soldiers of that monotone barricade present in said online journalism workshop, the voice of authority of the Cuban dictatorship. What is more, although independent blogger Yoani Sánchez was mentioned in the Assange-Castro-journalism dialogue, to brand her once again as a U.S. government mercenary agent and all the usual attributes government media have showered her with, she was not able to answer many epithets and accusations because she was not invited to the event and workshop, despite being the best known exponent and founder of the independent blogosphere, creator of the Blogger Academy and the largest blogger platform in Cuba, and has even published works on the use of Word Press. Assange, the champion of free speech, the angel of truth, did not question her unusual absence or that of other bloggers and journalists from independent digital media. But some truths, though out of context, did come out at the meeting. For example, I agree with Assange in that the Internet “for the first time offers us the most powerful tool to destroy media control and manipulation. But we face a great battle. The Internet allows each one of us to express the truth.” Don’t we know it, the bloggers and independent journalists who use the web to express our truths and break the official media blockade, which keeps us in a constant battle, not just on the web, but also in our physical lives! The government is sure to know that it doesn’t allow the expansion of internet usage at the same time it keeps many of our pages filtered, while maintaining a constant harassment against the exercise of freedom of expression, opinion and information! 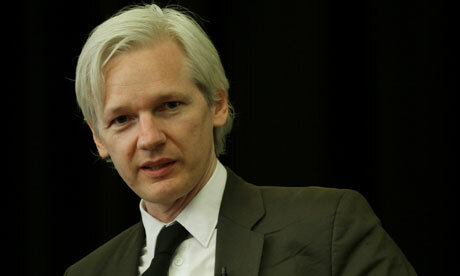 That explains why it is not possible that there is a Cuban Assange. That is why it’s interesting that Assange has declared he is impressed that Cuba “has managed to withstand 50 years of embargo within a mere 90 miles away from the U.S.”, and he doesn’t know how this has been possible. The truth is that, to clarify to ‘solidarity Julian’ the issue of “the embargo” and “the heroic resistance of the people” would be quite difficult, judging by the oblique view he has on Cuban history and reality. It’s almost pitiable the (naïve?) way this guy, so shrewd and experienced in computer battles seems to have fallen victim to the media hallucinations manufactured by the Castro totalitarianism. Personally, I don’t think so, but my readers already know that I tend to be insightful with some eccentric characters…Assange is not the exception. However, to give him the benefit of the doubt and to assume his intentions to be good, we could give him a very brief answer, telling him that what he terms “the resistance of the Cuban people” — which, in reality is the ability of the longest dictatorship in the West to cling to power — may be due, among other factors, to the solidarity of people like him. Monday, October 14th, 2013 | By Miriam Celaya, www.cubanet.org — If there is something in the past 55 or so years in which Cuban regime has been efficient it’s in the administration of news according to its own interests, a trick that consists in covering with words several printed pages and all the “news” media, without actually saying anything. Or another variant, not less crafty, which consists in launching information that they know will cause expectations and agitation in the public’s opinion, and then placing another, more significant story, though at first glance it may not seem so, and then it can pass virtually unnoticed. Such was the case of a convoluted news story published in the newspaper Granma last October 3rd, 2013 (“They Explain Changes in Criminal Legislature”, front page), at a time when the announcement of the ban on the sale of imported clothing to the self-employed and their seizure by the authorities was capturing all of the attention of public opinion. In fact, there has been no reaction of opinion on the subject of the legislature, though they complement the recent official measures against the self-employed. Another newly introduced amendment in the law is Decree 313/2013 of the Council of Ministers, which states “in which cases goods associated with a crime should be seized, and what entities should be in charge of the property directly related to a crime and what entities should be responsible for their acceptance or for securing them…” Items thus confiscated “could be marketed immediately and contribute to the state budget” and if “it is decided to return the goods” to an individual and the goods have already been marketed, the individual will be given goods of “similar characteristics” or he will be compensated financially. That is, the authorities will have the prerogative to establish the legitimacy or lack thereof of people’s assets and of what rights they may or may not have over the goods; the assumption of the power to sell particular properties to the State and the decision to determine in what cases property will be returned to citizens and at what values if they are to be compensated, all, of course, at the discretion of the same authorities. 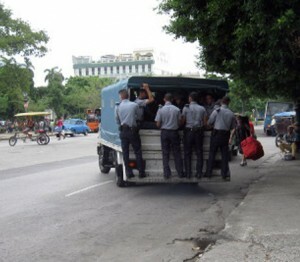 It is scary to think what levels of helplessness the common Cuban has reached, with the increases in the power of the PNR and the courts, that is, the repressive institutions at the service of the government. All this in a scenario marked by corruption at all levels, and particularly among the agents of “order”, in theory responsible for ensuring the public peace. I cannot think of anything more absurd of this government than to try to maintain social control by empowering an army of semi-illiterate corrupts supported by law professionals, as if this way the chaos that is upon us could be avoided. A few years ago, the General-President, whom some optimists considered a reformist pragmatist, announced that the measures to “renew the model” would not be retracted. He lied, but perhaps the original intention was truthful. The reality, however, showed that even the slightest chance for prosperity and economic independence goes beyond official controls and a totalitarian system cannot survive a reform process, however tentative and insufficient they may be. The recent amendments introduced to the Criminal Code and the Criminal Procedure Act are an attempt, as useless and it is desperate, to put the genie back in the bottle. 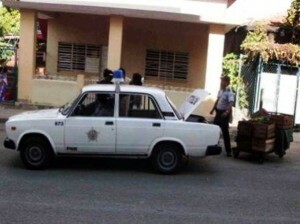 A twist of the screw so unfortunate that it will heighten the shift toward the worst case scenario: more corruption and repression against people increasingly unhappy and frustrated, just the least prone components to the control and order which the Cuban authorities are pursuing. Things are looking bad for the sale of clothing, so much so that many of Havana’s retailers who pay to be licensed as seamstresses or tailors are concerned about what’s coming. As of 28 September 2013, an official provision has gone into effect establishing that they can only sell clothing made by hand, on pain of heavy fines and confiscation of all the manufactured apparel they offer. 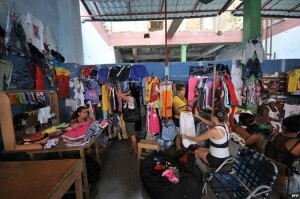 So far, the numerous private small business in Central Havana have remained open and are selling the same imported clothes without any official operation taking place. 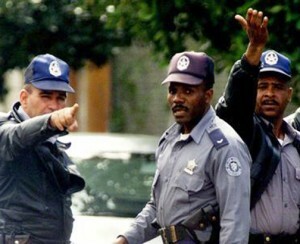 But there is a grim anxiety circulating among them and they know it’s only a question of time before the hordes of inspectors and the packs of uniforms come down on them. Anaís, one of dozens of clothing vendors who has opened private businesses in Central Havana, has already lived four decades and before having a self-employment license she knew how to make money working for herself. In fact, she had a business selling imported clothing, which then came from State warehouses and stores, through one of the multiple chains of smuggling networks that have proliferated on this Island since bans were instituted as a method of governance. Just half a block from Anaís a middle-aged couple complains. The man is more withdrawn and talks in monosyllables or just nods, approving what his wife says; she is more talkative, perhaps because she feels more confident talking to another mature woman like herself, or perhaps because she needs the catharsis. I tell them who I am and what I do — something for which they don’t give out licenses in Cuba — but that doesn’t scare them one bit. “Just don’t use our names,” they ask me. Of course not, I don’t even inquire. In reality, it’s not necessary, I’m just digging into what the media says, in what lies beyond the laws, the regulations, the statistics. I’m more interested in people and their reasons than in the government’s regulations and the propaganda of its spokespeople. Life is on the streets, and is very different and distant from those who make the laws and what the media shows. The woman tells me that a couple of years ago she took out a license as a dressmaker and began selling there, in the doorway of her sister’s house, and some time later, when they prohibited selling in doorways, she moved to the living room of the same house. It went well, so she was able to invest more money in merchandise and her husband also took out a license as a tailor. In a total of seven private shops I visited the feeling is one of uncertainty and discontent. All of the interviewees think that the solution would be to have a wholesale market in the country to legalize the sale of manufactured clothing, but we know that isn’t going to happen. The crux of the matter is that in a couple of years private businesses have successfully competed with the State’s hard currency stores, whose sales have fallen sharply as the self-employed multiplied. A greater variety for sale, more acceptable prices, better quality and friendly service are factors that distinguish the private owner versus State establishments, advantages that the government is in no condition to match, let alone surpass. It is clear that with the implementation of self-employment the government has opened a Pandora’s box that it cannot now close without facing the consequences. However, despite the repressive nature of the new provisions and the official obstinacy in refusing to license as retailers, the balance remains negative for the authorities. What was before is no longer. 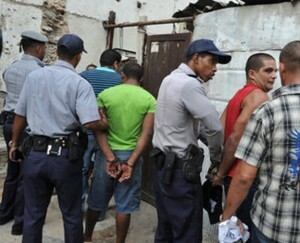 Meanwhile, there are more and more discontented Cubans in the streets. Given the circumstances, it seems fine to me to see if once and for all an awareness of autonomy and rights blossoms among the Cuban people.